How do you manage meal time with a busy family that has tons of obligations during the dinner hour? From cooking to cleaning to carpooling sometimes I feel like it never stops. And as my kids get older, their schedules get even more hectic – during what I find to be the dinner “witching hour” of all sports practices and meal time hitting between 5-8 pm! And my daughters schedule is even more rigorous and demanding since she’s in middle school. 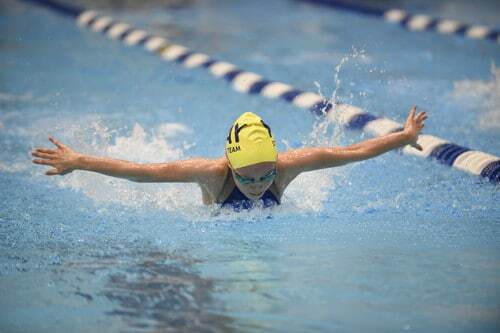 More swim practices and more homework mean we need to be super organized to manage our time – from household chores to homework to meal planning. So I’m all about convenient dinner options for our family like those from On-Cor. Finding easy to prepare frozen entrées that I can mix and match with veggies and salads at home to cut down on my “prep” and cooking time plus easy store, save, and re-heat for dinners on the fly at different times for each child is key. My kids, like so many children today, are super busy with athletics during the dinner hour. 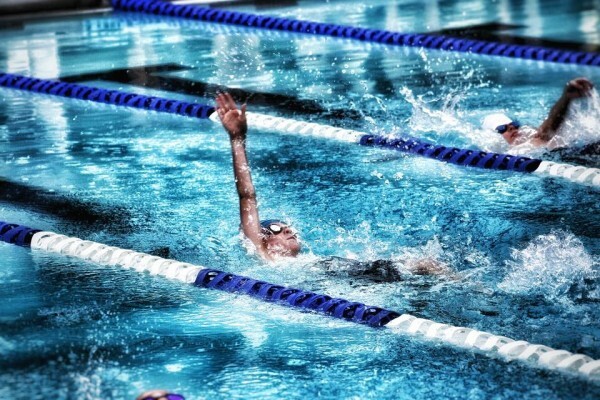 This means beyond healthy eating, I’m also always looking for tricks to easily juggle meal time around swim practice. I need something I can prep easily and also re-heat and serve since most weeknights I need to feed each kiddo at a different time in the evening. My son even likes to eat 2 dinners – a small one before swim practice and then post swim practice he’s starving and he wants the leftovers from dinner! Bonus: I love to be able to serve up any of these easy frozen On-Cor entrées in a pretty dish. Why give the illusion that my food took longer to prepare? 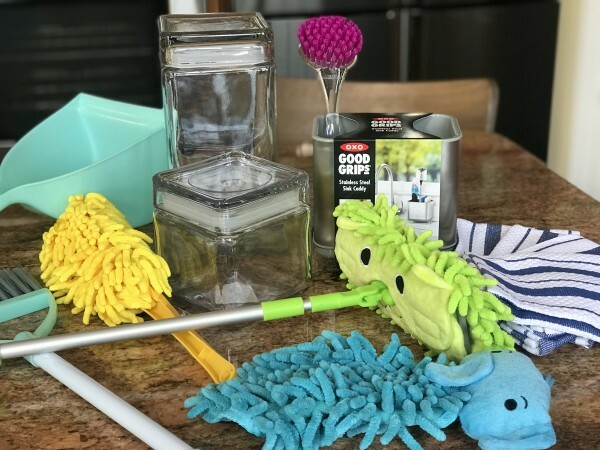 We’re giving away some cute kid style cleaning tools and kitchen goodies for Mom thanks to On-Cor in our prize package below. Entry details are at the bottom of this post. Finding lots of convenient ways to store food – from basic ingredients to dinner leftovers that we need to reheat helps keep the kitchen run more smoothly. And when it comes to scheduling – calendars are essential to reminding us all where we need to be and when we need to be there! Cute cleaning tools can motivate the kids to clean up too! 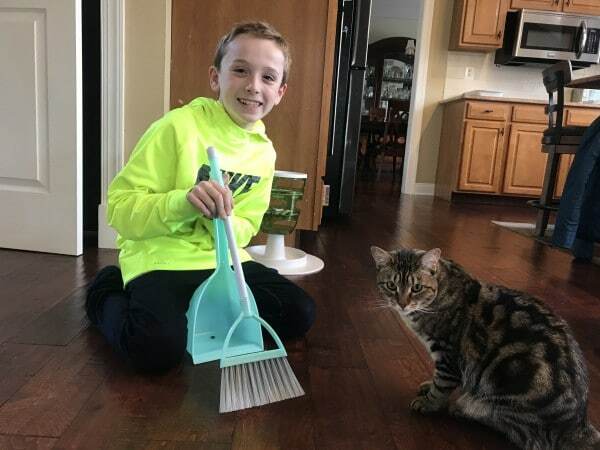 Kyle is in charge of sweeping up our kitty Stitch’s messy food and litter box so he loves this kid sized dust broom and pan. I’m all about feeding the kids fresh fruits and veggies but I love being able to compliment mealtime with a convenient solution for those active sports weeknights dealing with practices and even summer swim meets in the evenings. The positive news is that you can get a frozen prepared meals like those from On-Cor and feel good about ingredients. For instance, On-Cor entrées have no monosodium glutamate (MSG) added. Plus, meals like the Macaroni & Cheese entrée along with the Lasagna with Meat Sauce, use 100 percent real cheese. I’m always trying to sneak more protein into my kiddos diets too. They are growing fast and given our convenience style of cooking dinners with our active sports schedules, protein is often forgotten! If you are looking for more protein, On-Cor entrées now have 20 percent more meat, including Salisbury Steak, Sliced Turkey and Char-Broiled Patties. The Penne Pasta & Meatballs with Tomato Sauce entrée now has 25 percent more meat too. Yay!!! (ARV: $200) Giveaway open to US addresses only. Leave a comment below by March 27th, 2018 and share what your favorite On-Cor entrée is and what you would do when it’s cooking? Daily Comments as daily entries allowed. Follow Classy Mommy on her YouTube Channel here. Leave a comment to let us know you are following. Follow Classy Mommy @ColleenPadilla on Instagram. Leave a comment to let us know you are following. Follow Classy Mommy on her Facebook page here. My favorite On-Cor entrée is the Salisbury steak dinner and while it is cooking I would start my spring cleaning of the kitchen. Favorite is the chicken patties. Would take care of other chores while it is cooking. My favorite are the barbecued pork riblets. We eat them on hoagie buns like a McRib sandwich. I think I would use the extra time to get my lawn ready for spring. I love the On-Cor mac and cheese entree and while it is cooking i will be online. We love the Salsbury Steak dinner. When its cooking Im usually throwing a load of wash in and getting stuff ready for the next day. I love the On-Cor mac and cheese entree and while it is cooking I will take a nature walk. They have a few breaded entrees that look great, but I prefer the ones without breading because the breaded ones can potentially be soggy. I like their mac n’ cheese entree. I would play board games with my kids. I follow your youtube channel. My family loves the chicken parm! We would go for a family walk. My favorite On-Cor entree is the salisbury steak dinner and while it is cooking I will watch a movie with the family. I like the sliced turkey and gravy meal. I would get my house cleaning chores done while it was cooking. I like the lasagna and I would read a good book while it’s cooking. I also want to try their Southern Style Gravy with Breaded Beef Patties. I grew up eating chicken fried steak. I love the On-Cor salisbury steak dinner and while it is cooking I will take a bubble bath. While not one of the entrees, I would like to try those cheese noibblers, but they aren’t sold in my area. I love the On-Cor salisbury steak dinner and while it is cooking I will walk the dog. I love the On-Cor salisbury steak dinner and while it is cooking I will start spring cleaning my closet. My favorite are the barbecued pork riblets. I love On-Cor mac and cheese entrée and while it is cooking I will shop online. I get the barbecued pork riblets, and I will spray weed killer on my lawn while it is cooking. 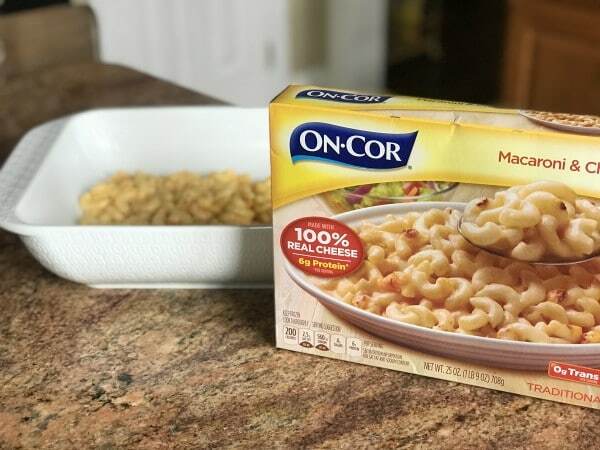 I love On-Cor mac and cheese entrée and while it is cooking I will wash the car. The chicken fried steak patties are a great option. I love On-Cor mac and cheese entrée and while it is cooking I will do the laundry. Hope you are having a wonderful weekend. Thanks for the chance to enter. I love On-Cor mac and cheese entrée and while it is cooking I will do some painting. I love On-Cor mac and cheese entrée and while it is cooking I will do some writing. I love oven baked mac and cheese, so I would try their variety. I may even put a little extra cheese on top!! I love On-Cor mac and cheese entrée and while it is cooking I will do some ironing.